70kW solar photovoltaic (PV) systems are a popular system size for small and medium-size businesses to cut their power bills in Australia. In this article we look at the typical price ranges and power output for a 70kW solar system. We also examine some of the factors necessary for ensuring that a 70kW system and systems of similar size are a good investment. Solar system prices have fallen dramatically across Australia in recent years. Being towards the upper end of the size scale for non-utility scale solar projects, 70kW systems benefit from economies of scale, generally costing less per watt than smaller, residential solar systems. Solar Choice publishes pricing ranges for commercial solar systems on a monthly basis using data from our installer network. These Commercial Solar PV Price Check articles provide the Australian solar industry (and customers) with a means to get ballpark figures about what a system might cost. Although the data does not include pricing specifically for 70kW systems, it does contain numbers for 50kW and 100kW installations. If you’re not sure what system size you need, or if you want to compare quotes from multiple installers on a system of a specific size, you can fill out our Solar Quote Comparison request form to the right of this page (click ‘Commercial’). Solar Choice will get in touch with you soon afterwards for a no-obligation chat. 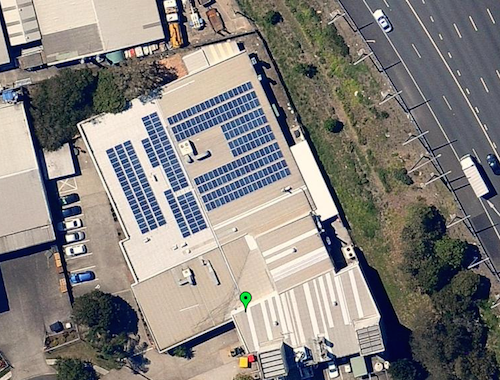 70kW solar power installation on the roof of Vector Aerospace in Brisbane. Project tender managed by Solar Choice Commercial. To see more photos of commercial installations managed by Solar Choice, visit our Tender Management page. The quality of the system’s components. All of these things should be considered carefully when estimating how much power a solar array might produce. The more sunlight there is in your area, the more power a solar system will produce there. Generally speaking, a system in Australia will produce 4 kilowatt-hours (kWh) per kW of capacity per day on average annual. In the summer, it will be higher, while in the winter it will be lower. What factors affect a 70kW solar system as an investment? The amount paid, if any, for surplus power fed into the grid or sold to a 3rd party. 1) The long-term investment-worthiness of a 70kW solar system will depend to a large degree on its cost. It’s important to discriminate between ‘cheap’ and ‘good value’ systems. Don’t go with the first offer that comes your way – make sure you shop around for the best deal. 2) If you’re looking into solar, it’s probably because your electricity bills have risen dramatically in recent years. With a solar power system, a business can significantly reduce its reliance on grid electricity – and therefore its power bills. Thousands of businesses in Australia have figured this out and have made the choice to go solar. Solar Choice Commercial has a team devoted to working out how solar PV can benefit our commercial clients. Read about what our Commercial Business Case and Design Team does. 3) Financing can be key in ensuring the economic viability of going solar. Make sure you know your options. Solar Choice Commercial offers a unique commercial solar PV financing package that enables the right customers to set up a solar farm or other large-scale installation with no capital expenditure, among other benefits. Learn more about Solar Choice’s Commercial Finance Package. 4) Businesses usually go solar with the aim of reducing their power bills by generating their own electricity. However, in certain cases, it may be possible to take advantage of a feed-in tariff incentive scheme or to negotiate a power purchase agreement (PPA) with a 3rd party. Either of these, if available, will do much to make going solar an even more attractive prospect. Contact Solar Choice Commercial to learn more about your options. If you are considering a 70kW solar system (or any size system) for your business, feel free to get in touch with our Commerical Solar team. You can do this by filling out the Quote Comparison Request form to the right of this page (click the ‘Commercial’ tab). Top image: Downfields Engineering 70kW solar system. Next post: Solar panels after 25 years: Is there an afterlife?